Preheat oven to 400 degrees F. Cut off top of garlic head, place on a piece of foil, drizzle with oil and sprinkle with salt and pepper. Wrap tightly with the foil and roast until tender, 30 to 40 minutes. Let cool. Roughly chop pepper, discarding seeds and membranes. ***OR you can use roasted red peppers from a jar if you prefer. Squeeze garlic cloves out of skins. Place pepper and garlic in food processor; add cumin, coriander and sour cream; puree until smooth. Season with salt and cayenne pepper. Cover and chill. 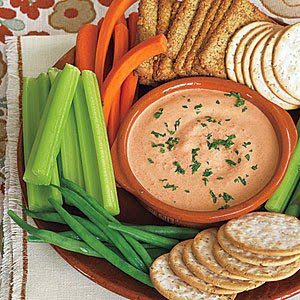 Serve with assorted crudités and crackers.